Design and Animation of the final display. In a multi-disciplinary team, we were tasked with designing a data driven environmental display for a transportation hub at the San Juan Islands. The environmental display had to facilitate travel related decision making and itinerary planning by the travelers at the hub. Parallel to understanding the user needs and goals, we modeled the data into information architecture to understand the data and metadata along with their relationships. Next, we modeled the data according to the user needs and goals. While the models were still abstract, the reiterated sketches allowed us to restructure the data, filter information, create new groupings and establish hierarchy. These models gave shape to the initial sketches. Next, we wire-framed the display sketches keeping the user needs and goals in mind. We came up with various ideas to inform the users about their travel details in an efficient and useful manner. 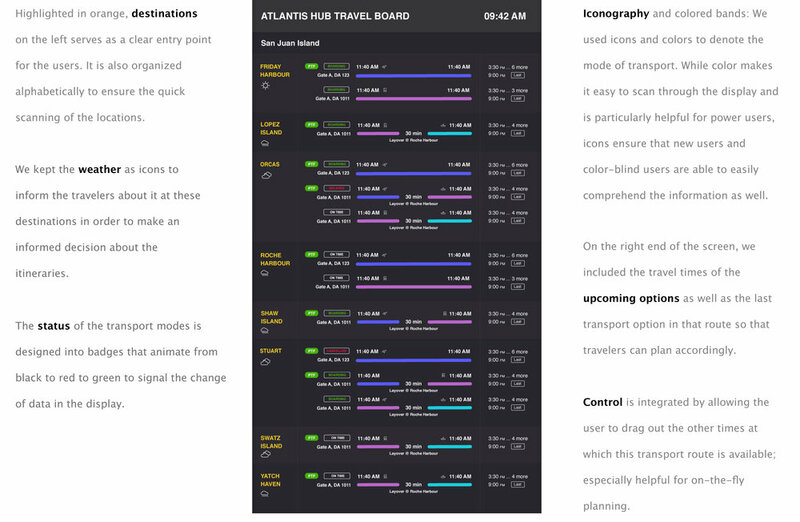 The initial ideas were voted on by the team and converted to digital sketches with initial thoughts on layout, color, typography, orientation and spaces.